Sliced bananas, vanilla pudding and marshmallows join forces for a deliciously sweet tour de force. Beat pudding mix and milk in large bowl with whisk 2 min. Let stand 5 min. Stir in marshmallows and COOL WHIP. Place banana slices in crust; cover with pudding mixture. Substitute 1 cup raspberries, blueberries or peeled peach slices for the banana slices. 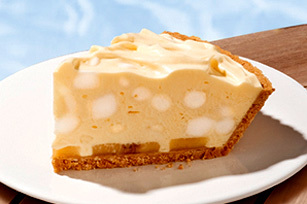 Prepare using 1 ready-to-use vanilla wafer pie crust (6 oz. ).